Retrofitting existing coal-fired power plants to capture CO2 is an important GHG mitigation option for the United States. Coal power plants are large point sources and account for roughly 37% of total U.S. CO2 emissions. Also, retrofitting utilizes the base power plant and related infrastructure and so the cost and level of disruption could be less than other greenhouse gas mitigation options. NETL studied the 738 coal-fired generating units currently operating in the United States and estimated how much the capital cost and parasitic load for CO2 retrofit would vary from unit to unit. 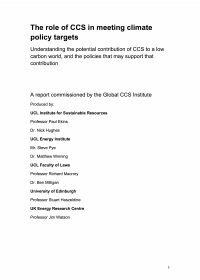 Site-specific characteristics such as base plant efficiency, whether or not the unit has a sulfur scrubber, the efficiency of the sulfur scrubber, how much water is available for the unit to use, and how much space is available for the CO2 capture and compression equipment were factored in to an estimate of CO2 capture cost at each generating unit. 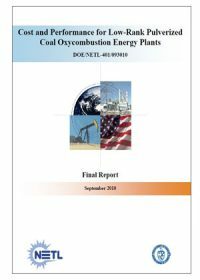 The objective of this report is to present an independent assessment of the cost and performance of low-rank coal oxycombustion power systems, specifically PC and circulating fluidized bed (CFB) plants, using a consistent technical and economic approach that accurately reflects current market conditions for plants starting operation in 2015. Given the importance of coal to power generation in the United States, where coal-fired power plants supply around 50 percent of the Nation’s electricity needs, examination of the costs and practicability for retrofit of existing pulverized coal power plants with CO2 capture technology is a valid exercise. To help elucidate this issue, this study defines a viable population of pulverized coal plants, which were examined individually to determine costs and space availability for retrofit. 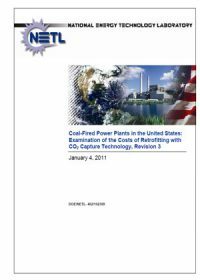 The task was to assess coal-fired power plants in the U.S. relative to the cost and feasibility for retrofitting with CO2 capture technology. This document was developed by the US Dept. 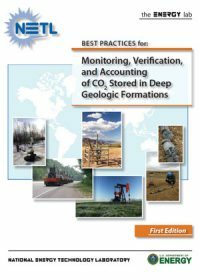 of Energy’s National Energy Technology Laboratory for regulatory organisations, project developers, and national and state policymakers to increase awareness of existing and developing monitoring, verification, and accounting (MVA) techniques used during carbon sequestration. 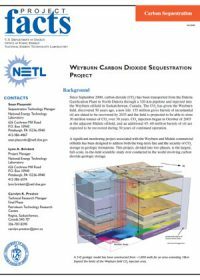 This National Energy Technology Laboratory Fact Sheet provides an overview of the Weyburn Carbon Dioxide Sequestration Project in Saskatchewan, Canada. 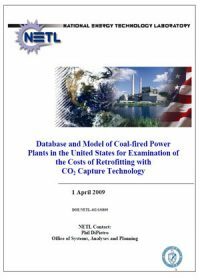 As part of an assessment for analyzing the prospects of retrofitting existing coal-fired power plants for carbon dioxide (CO2) capture and sequestration, an integrated analysis using the National Energy Modeling System (NEMS) of the Energy Information Administration was undertaken using a generic model of retrofit costs as a function of basic plant characteristics (such as heat rate). Modifications to NEMS were made to enable an endogenous determination of the tradeoffs between retrofit, retirement, and the purchase of emission allowances. 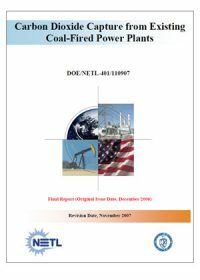 The cost for CO2 retrofit included direct costs (capital and O&M), indirect costs (capacity and heat rate penalties), and a nominal cost for transportation, injection, measurement, monitoring, and verification (MMV). 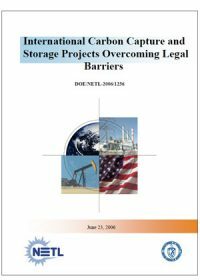 This study was performed to evaluate the technical and economic feasibility of various levels of CO2 capture (e.g., 90%, 70%, 50%, and 30%) for retrofitting an existing pulverized coal-fired power plant (Conesville #5 unit in Ohio, United States) using advanced amine-based capture technology.